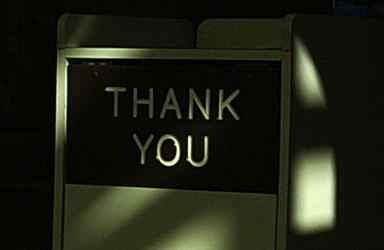 We live in a world where “thank you’s” are taken very lightly. We are quick to shoot off a Facebook message with a “TY” rather than take the time to do things right. Because of the gap between those who put much effort and genuine thought into their messages of thanks and everyone else, it’s now easier than before to make your feelings of gratitude stand out – for little money at all! Do you remember the last time you called up a friend or relative and said “thanks” for a birthday gift, help with an errand, or just their friendship? While it’s extremely difficult to catch people at home nowadays, you could leave a message saying that you appreciate what they’ve done and that they mean something to you. If you manage to get them on their cell phone, make the conversation brief, but real. A “you don’t know how much it helped me that you did that” will suffice. Thank you notes don’t have to be elaborate. In fact, postcards can do the trick nicely. For less than the cost of a full-blown letter, you can grab a postcard from a shop and pay the postage for your message of appreciation. For something extra whimsical, pick anything that can be mailed safely through the postal system for less than a dollar and Sharpie your note and the receiver’s mailing address. Examples include a pretty and durable plastic plate or the cover from a beautifully-illustrated antique book that you rescued from the trash bin. Most people love cookies. Take a moment to find out any special dietary needs (gluten-free, no nuts, vegan), and bake up a batch they will love. No time to bake? Snag a set of cupcakes from a boutique baker in your area and personally give them to your friend. Sweets speak volumes about how you feel! No one has a perfect life, and most people will readily admit to where they aren’t able to make ends meet. Maybe they can’t get a sitter for a certain night. Perhaps their lawn mower broke and the weeds are growing too quickly. Whatever the need – fill it! It can be a one-time way to give a genuine message of appreciation, and you will start a cycle of neighborly “helps” that can last a lifetime! The last and most valuable thing you can give a friend who has done something nice for your is to — wait for it — be a good friend. Even if you aren’t close, there will come a time when they may wish to share something with you. You should listen, not expecting anything in return, and show them that they are important to you. This isn’t because you “owe them”, but because it is the right thing to do. You obviously should reserve this tactic for people you really want to develop a friendship with, but because listening and thoughtfulness is so rare these days, you can communicate a whole bunch of “thanks” by just practicing good listening skills. Has someone done you a “solid” lately? How have you said “thanks”? If you haven’t, why not? When I was in college and living in the dorms, the biggest thing someone could do for you was often to do your laundry. Especially during crunch times with projects and tests, having someone else take care of that chore was just an amazing favor. A while back a friend of mine dropped a nice note and a loaf of homemade bread (her mom’s specialty) off at my door. Another time, some friends dropped by with dinner, home made, still warm and ready to eat. They knew I was having a crazy week and that dinner was often whatever I could manage to scrounge and microwave. They didn’t want to stay and chat or anything, it was just a “drive-by dinner drop-off”. Both of those were amazing things. I have some friends who moved to a smaller city out of state and have lamented the lack of specialty grocery stores. I recently sent them some of the meat spice mix that they love but can’t get where they currently live. That’s not something I would do for everyone, but for them it was a really great, personal thank you.